First published in the 1980s, The Political Psychology of Appeasement contains some of the most influential political journalism of the 1970s. The author, a leading contemporary historian and commentator on international affairs, provides an incisive critique of the weaknesses and inconsistencies of U.S. foreign policy in the 1970s as well as a diagnosis of the malaise of Western Europe. 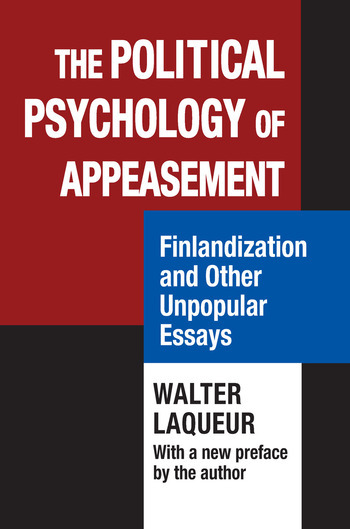 Laqueur's essays range from the subject of Finlandization to the problems of peace in the Middle East and the origins of political terrorism. To each of these areas he brings a deep and compassionate sensibility, the knowledge of a professional historian, and the sharp eye of an experienced journalist. Not only is Laqueur a global thinker, but his thought is undergirded by the experiences of world travel and an intimate knowledge of world leaders. Most of this book's essays are pessimistic because the author addresses his topics bluntly and pragmatically. Many of Laqueur's predictions have been borne out by subsequent events. As he ruefully says in his original preface, there is nothing so conducive to lack of popularity than to be right prematurely. Made timeless by their insightful honesty, his essays teach us about the art of political appeasement and prediction in the modern geopolitical landscape.